I think there’s so much history and culture to absorb and I only wished that I had visited before I left Trinidad to live in the UK. I’m sure this won’t be a surprise….. I know it’s such a couples trip but I can’t help but be drawn to the blue skies reflecting off the waters. To me it just signifies peace and tranquility. Hmm wonder if it means that I need a holiday? There’s something about this place that has been calling me for a while and I decided to answer its call…finally! So look out for a post on this before the end of the year. I’m sure this is the place that is on most people’s bucket lists and like them it’s on mine too. I don’t have a specific place in mind, all I know is that I’d just like to land and go wherever the waves take me. It’s practically on my doorstep and I haven’t visited as yet. I realise that I have an affinity with Spanish speaking countries and think it’s because Trinidad is so close to Venezuela. We have a huge Spanish influence in our culture and food, which is yummy. Plus I really like the language which I can’t speak fluently but, it’s definitely something to work on especially with Duolingo. 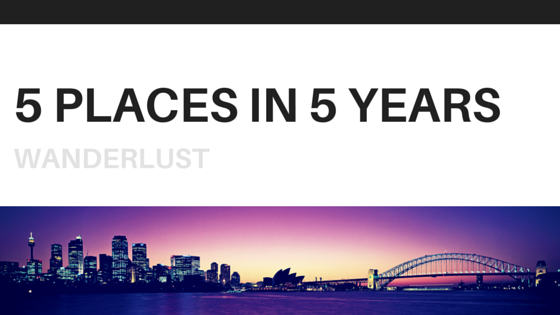 That’s my list of 5 places in 5 years (for now). Do you think I can accomplish it? I’d love to know where do you plan to go? Let me know in the comments below. Oh and it would mean the world to me if you were to subscribe :).